And literally everyone in the survivor’s club are slowly beginning to lose our minds. 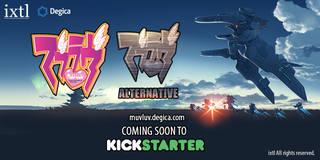 This September Degica and itxl are finally bringing Muv-Luv to the west via Kickstarter. Here’s what we know so far, subject to change. Muv-Luv is a romantic comedy/science fiction franchise created by âge in 2003 that has never seen a release in the west. Muv-Luv Alternative is widely considered the greatest visual novel in existence by both Japanese and foreign audiences. Among other things, Degica and ixtl are looking at bring over the main trilogy (Extra, Unlimited, Alternative) with updated visuals that are compatible with modern versions of Windows (7, 8, 10). They’ll also have stretch goals for things like brand new visuals and music for the western release, as well as a digital lorebook for the franchise, the translations for side story compilations Photon Flowers/Melodies, and both Android and Vita versions. Stay tuned for more overzealous ML coverage with our crack team of ML experts on the Muv-Luv tag.